Shio Koji became firmly established as a seasoning in Japanese foods. It seems like it has been found in the recent years, but it is traditional Japanese seasoning that were first made in the Tohoku region. Salt and koji was fermented and combined with water. If you put shio Koji on meat and fish, a protein and starch is broken down into amino acids and sugar, and the taste is more flavorful. It could also be enjoyed with vegetables and drained tofu. It is simple to use. For meat and fish, apply two teaspoons of shio koji, wrap it in plastic, and refrigerate for two to three hours and then bake it. For vegetables, cut into desired pieces and put it in a plastic bag. Add in two teaspoons of Shio Koji and make sure the veggies are glared with the koji. Enjoy after cooling it for two to three hours. If you let it cool overnight, the results are more flavorful. 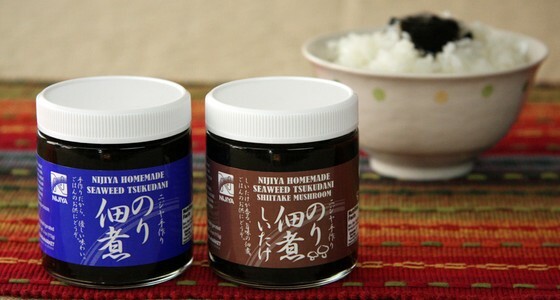 Please enjoy Nijiya’s Homemade Shio Koji for your everyday cooking! “Sesame Seed Hulled Toasted” is a new product by Nijiya. Sesame seed contain high level of sesamin, sesamolin and sesamol which are natural antioxidants. Especially Furofuran Lignans in Sesamin increase resistance of cell membranes and is an effective anti-aging agent. However Sesame seeds are protected by a hard shell which prevents digestion and absorption of its nutrients. Roasted Peeled Sesame Seed by Nijiya removed this hard shell with a special machine for easier digestion and absorption of nutrients. It is suggested to take 10 ~ 15 g a day for your health. 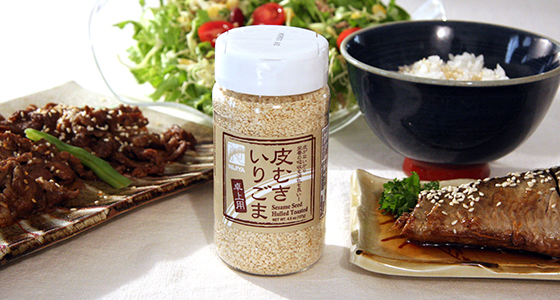 The Sesame Seed Hulled Toasted by Nijiya comes in a bottle easy to use, shake it over salad, meat and fish dishes. Enjoy it in every meal. Nijiya “Nukadoko set” is a new sale item and all the necessary ingredients has been set- Organic Rice Bran, Salt, Dried Konbu Seaweed and Red Chili Peppers- to set it up. You can make your own Nukazuke at home with this convenient set. Nukazuke is popular Japanese pickles that are pickled with lactic fermented rice bran. Basically, vegetables and fish are pickled with it. Popular ingredient for Nukazuke is vegetables such as cucumbers, eggplants, Daikon radish, turnips and carrots and usually need one to two days to complete pickling. You can seize many advantages from Nukazuke “at home” more than “retail”. For example, you can use seasonal and favorite ingredients and choose your favorite degree of pickling. 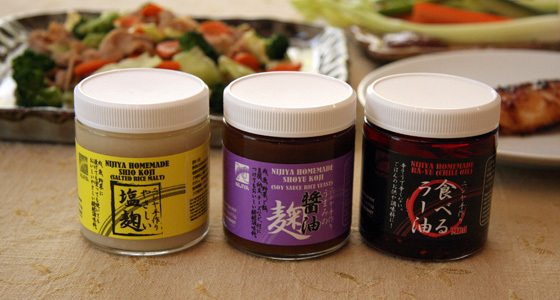 What is better than other products is that this set contains “soy sauce powder” that makes our Nukadoko unique. Please use the container of this package for your convenience. New items are added to our popular “Nijiya Small Bottle” series-Nori Tsukudani and Nori Tsukudani w/Shiitake. Nori tsukudani is made with very simple ingredients-Nori seaweed and seasonings, and added Shiitake Mushrooms to it is Nori tsukudani Shiitake. 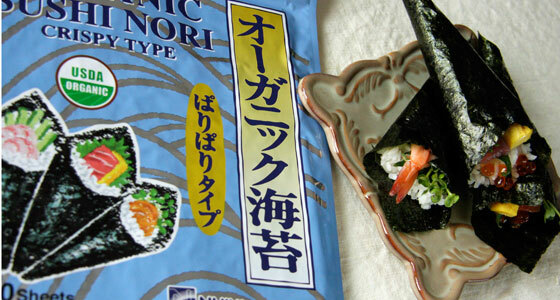 Nori Seaweed is rich in Protein, Vitamins and Minerals. In addition, we made it without MSG and thickener so that you feel natural and gently smooth taste. Enjoy on steamed rice and of course with Onigiri! Because of chilled item, these items are not available online. Crispy type that is great for temaki sushi. It comes in 10 slices per pack so cut it into 1/4 and enjoy temaki sushi with fresh sashimi from Nijiya with your family! It is available at your closest Nijiya Market, OR at Nijiya Online Store!! Nijiya「Tsuyu Tennen」is a perfect combination of flavorful soy sauce and dashi soup stock. Add 2 part of water to 1 part of this stock sauce for cold udon noddle and tenpura. Dilute one part soup stock into six parts water to make hot udon soup. Sake is made ​​on the basis of raw materials rice, rice koji and water. Fermented soft solid, called “Moromi (mash)”, is formed in the brewing process. Sake is the liquid resulted from squeezing “Moromi”, and its residue is “Sake-kasu (lees)”. Nijiya’s Sake-kasu is more matured and pasted lees called “Neri-kasu”. This superb Sake-kasu has more umami and is rich in aroma and taste. It is also fresh and soft so that you can use it easily. A lot of nutrients from yeast remains in Sake-kasu, including carbhydrates, proteins, fibers, and vitamin B. It is certainly a healthy food. 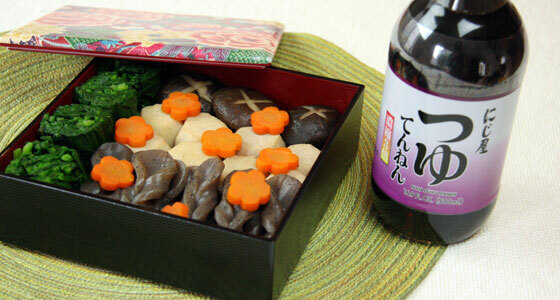 You can use Sake-kasu for daily dishes such as Kasu-jiru, pickles, and desserts. 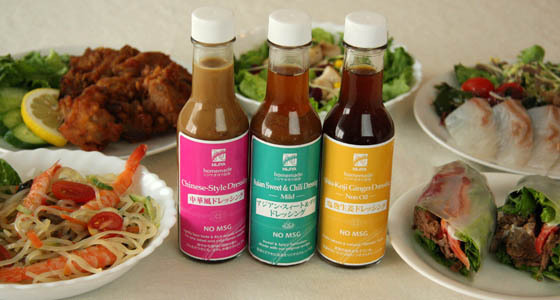 A variety of tasty dressing based on original recipes is available at Nijiya Market. Similar in taste to many Thai dishes, this item has a sweet, spicy, and ethnic flavor. Fish sauce brings forth the delicious taste. This dressing is excellent not only for salads but also for Japanese vermicelli and spring rolls! This dressing goes well with fried dishes too. This item is a soy sauce based dressing with the appetizing scent of sesame oil. A subtle flavor of mustard accents the taste. This dressing is excellent not only for salads but also for Hiyashi Chuka( chilled ramen noodles), steamed chicken, and somen salads. This item is a healthy non-oil dressing with the rich flavors of shio-koji (salted rice malt) and ginger. The stinging taste of ginger brings a refreshing accent to the taste. 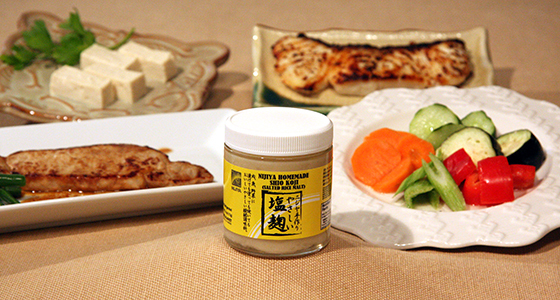 This dressing is excellent not only for salads but also for cold tofu, sashimi, yakiniku, and broiled fish dishes. Shoyu Koji is now very popular following “Shio-Koji”. It is made with soy sauce and malted rice. Because soy sauce is fermented food, Shoyu Koji has over 10 times of Glutamine compared with Shio Koji. In short, Shoyu Koji has more Umami than Shio Koji. The point is an excellent balance of Umami, Sweetness, Saltiness, and Flavor. In addition, Fermented foods are very nutritious and will help people being healthy. Substitution of soy sauce for Grilled Meats/Fish/Vegetables, Natto, or Sashimi. Subsidiary for Steamed Rice, Tofu, Cheese, or Fresh Vegetables. Dressing as mixing with Vinegar and Vegetable oils. Shio-koji is very popular in Japan. Shio-koji is Japan’s traditional seasoning made by fermenting and maturing a mixture of rice malt, salt, and water. 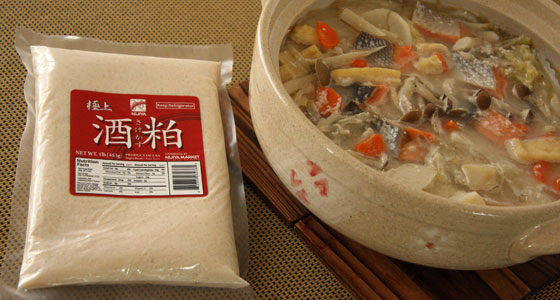 It has long been used as a seasoning for pickled vegetables and fish. Nowadays, shio-koji has been known as the “magical ingredient that makes any material delicious” and has been used in many different ways. It can be used to pickle vegetables, fish, meat, and tofu or used as an ingredient for stewed dishes, fried dishes, pasta dishes, and dessert. By spreading one or two tablespoons of shio-koji on a sliced piece of meat or fish and letting it sit for a half day or day wrapped in saran wrap (refrigerated), that makes the piece of meat or fish extra tender and flavorful. looks very spicy but not so spicy. The significant point of this item is “Umami” from Konbu Seaweed and Dried Shrimp. In addition, plenty of fried garlic adds chunky texture. 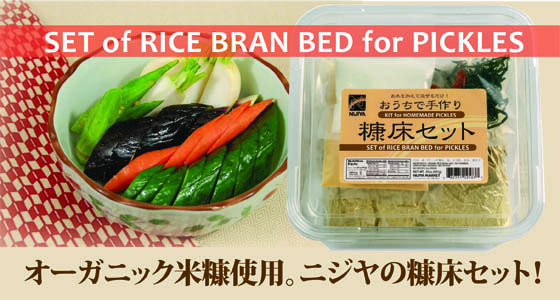 Delicious on steamed rice, Ramen Noodle and Gyoza, and great for stir fry or BBQ. We select less spicy pepper so everyone can enjoy the great taste, even kids or people who are not good at spicy food. Chicken Curry & Beef Curry with chunk of meats! 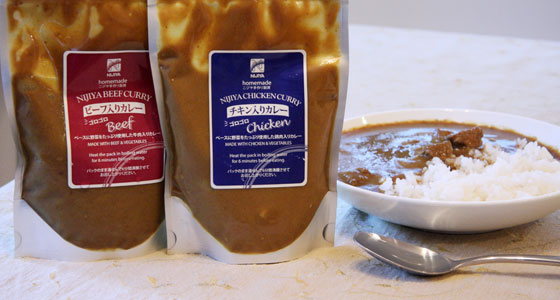 New Chicken Curry and Beef Curry are coming with chunky meats. The bases of soup are made with chicken (for chicken curry) or beef (for beef curry) that are rich in Umami, and cook with plenty of onions, carrots, and celery. All vegetables are melted during slow cooking, so you never miss the nutrients of all vegetables. Now we add chunk of chicken meats for chicken curry and beef for beef curry. Consequently, the curries are more volume and Umami than previous ones. Preparation is very easy; warm the package with boiling water for six minutes, and serve. You can enjoy light taste of Chicken Curry or a rich taste of Beef Curry depending on your favor. * Available at California stores only.